I said last week that I had a few YA novels for you to try, and that is true. These are them. What I did not anticipate was that Selection Sunday would happen, the amazing and undefeated Wichita State Shockers would be assigned to what Vegas oddsmakers are calling the most ridiculously difficult regional ever in the history of the NCAA Tournament, and that I would subsequently transform into a quivering ball of anxiety, nervousness, and excitement incapable of doing any work. Who can concentrate on reading and writing when March Madness is looming and your oft-overlooked team is 34-0? But I'm harnessing some discipline today. I'll hold off on singing “One Shining Moment” and dancing around the house for an hour or two and direct my attention to this pair of YA novels that turned out to be surprisingly complementary. Ah, serendipity. It's that thing where you dig through the rickety “YA New Releases” shelf in the back corner of the library and come up with two books that, on the surface, have nothing in common, but turn out to be about the same thing. 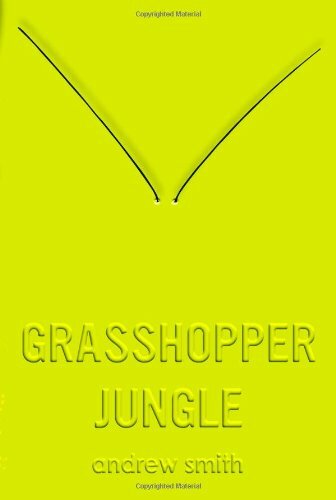 Grasshopper Jungle is narrated by Austin Szerba, a teenage boy living in small-town Iowa. He spends a lot of page-space talking about things that make him horny, which I personally found excessive, but my research tells me that it was a fairly accurate representation of the teenage boy brain. Austin is confused about his sexuality, as he is drawn to both his girlfriend, Shann, and his best friend, Robby. Oh, and a plague of six-foot-tall praying mantises is unleashed on the world, and Austin and his friends must defeat them and repopulate the Earth with humans. The book is a fast read with a highly unusual premise, and will likely find fantastic success with audiences younger and maler than I. There's a lot to like. If I were still teaching, I'd probably recommend this book to a certain breed of pasty, quiet male students. One problem though, that I can't stop myself from mentioning: Once I noticed how flat all the female characters were, how absolutely nonessential they were to the action (except for literally producing a baby), and how they were constantly marginalized by the more important, more vivid and powerful male characters, I had a hard time enjoying myself. Sure, Smith may create a realistic teenage boy character by painting Austin Szerba as a misogynistic, selfish user of women, but it doesn't mean it's fun to watch. 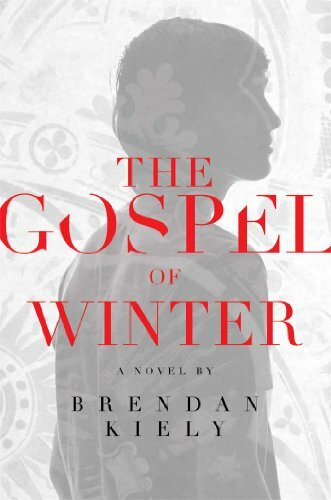 The Gospel of Winter is narrated by a different teenage boy, Aidan, who is also confused about his sexuality. However, his issues stem from abuse he suffered at the hands of a priest. Aidan is now trying to deal with his past by drowning it in drugs and alcohol, to which he has easy access thanks to his wealthy and inattentive parents. The book is a detailed exploration of tactics employed by abusers to manipulate victims, justifications that enablers use to ease their consciences, and the emotional wreckage that results in the victims' lives. Because of his experiences with Father Greg, Aidan isn't sure what a normal, healthy relationship looks like, and at times finds himself seeking out the role of abuser so that he can avoid feeling powerless. This cycle, though in some ways counter-intuitive, is absolutely real, and Kiely has sensitively portrayed it so that it makes sense to those of us who haven't been in abusive situations. The inadequate, callous way some characters respond when Aidan finally speaks up about what happened to him made me viscerally angry, mostly because I know those things have all been said to victims in real life. However, the way Aidan's girlfriend Josie maintains boundaries, sticks up for herself, and encourages Aidan to tell the truth made me want to stand up and cheer. Unlike Smith, Kiely doesn't shy away from strong female characters. Though they take different routes, both books end up being about the same thing: a teenager who is searching for identity and belonging. Austin and Aidan are both unsure of who they are and how to relate to other people. We've all been there, am I right? With or without giant praying mantises or abusive priests.